On the afternoon of Thursday, June 15th, Carolina Wildlife Center’s Director of Rehabilitation, Julie McKenzie received a phone call from Jennifer Gordon of Carolina Waterfowl Rescue requesting assistance with rescuing native wildlife animals found at a homicide crime scene in Chesterfield County. Julie jumped in her car and drove to Chesterfield where she joined Carolina Waterfowl Rescue, Carolina’s Reptile Rescue & Education Center, Chesterfield County, SC Animal Services, Animal Rehabilitators of the Carolinas and found hundreds of illegally held wildlife animals. The victim was running an illegal animal trade business out of the home and as a result of inadequate care 80% of the animals found were dead from neglect or starvation. Following hours of examining the dogs, venomous and non-venomous snakes and turtles the surviving animals were divided among the various animal rescue organizations for rehabilitation. Among many others reptiles, a large group of Spotted Turtles were found on the scene. Spotted Turtles are a threatened species in SC. 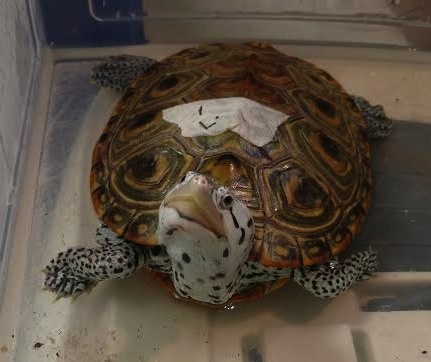 It is illegal for individuals to have a spotted turtle in their possession without a permit. We were called not only because we have this permit, but also because Julie has years of experience in reptile rehab and specializes in turtles. Julie ended up traveling back with 22 turtles and would have taken more if we had the room. 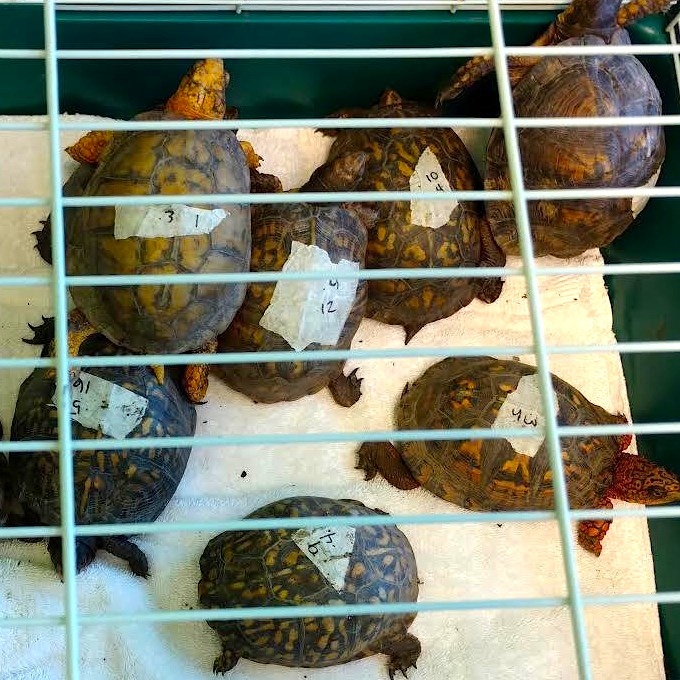 In total 10 spotted turtles, 10 Eastern Box turtles, 1 Diamond Back Terrain and 1 Alligator Snapping Turtle were admitted to the center for care. 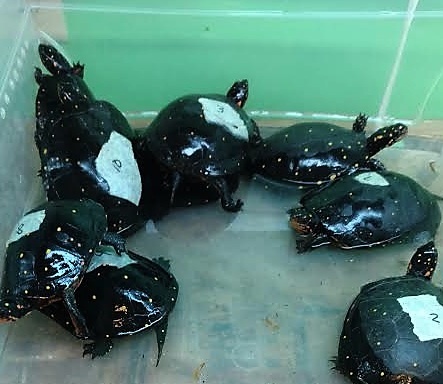 Some of the turtles are not doing well and in need of medical care. This rescue would not be possible without the collaboration of all the rescues mentioned. Please consider donating to help us all continue to help these animals. As for CWC we desperately need filters to maintain good water quality for the Spotted Turtles rescued. We could also use EcoEarth to provide a comfortable substrate for the box turtles rescued. The Alligator Snapping Turtle would love some fresh caught fish! UVB lighting is also a great need. Also live insects, mealworms, wax worms and cricket provide a nice meal for our rescued shelled friends. NOTE: We have received several other surrendered animals this year that were illegally removed from the wild. Most wildlife is protected by Federal and/or State laws and possession, harassment or destruction of these birds and animals can carry heavy fines and penalties. If you see or know of a potentially illegal situation, please contact Carolina Wildlife Center instructions on how to save these animals from harm.